In 2013 a BBC Panorama crew embedded with jihadists. Was the resulting documentary fake news? 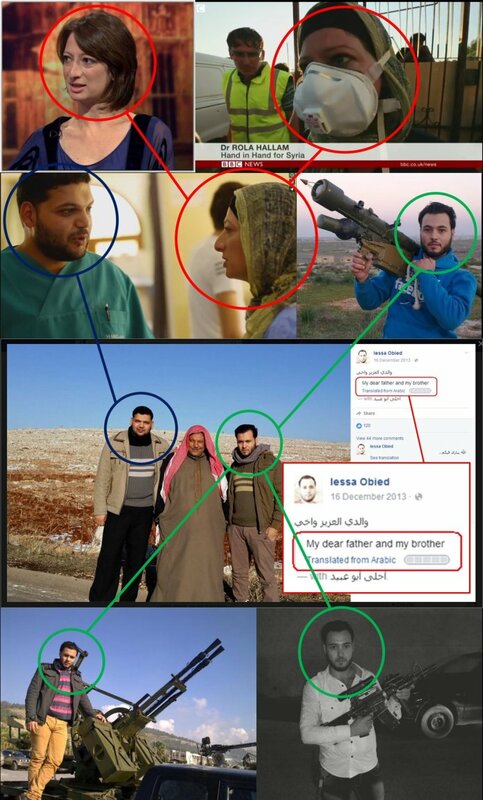 OverviewDid BBC Panorama collude with ISIS and other jihadist groups in Syria to stage an atrocity? 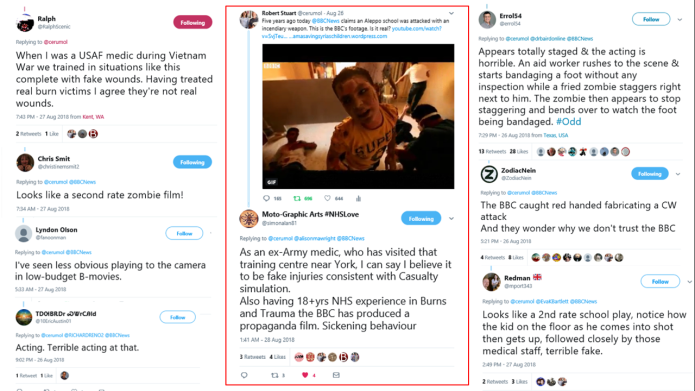 Are the alleged “napalm” injuries real? Why was the first report broadcast as parliament was voting on bombing Damascus? Is the UK charity featured linked to terrorism? Has a key witness been identified and will she go on record to blow the whistle? What are the consequences for the BBC’s global reputation? My name is Robert Stuart. For the last five and a half years I have been researching Saving Syria’s Children. Now I plan to make a documentary about it. Furthermore, I’ve uncovered irrefutable evidence that the BBC Panorama crew was embedded with a jihadist group during the programme’s making – a group which was at that time partners with ISIS and which the BBC elsewhere describes as “hardline Islamist“. Was BBC license fee revenue paid to this group? More shocking still, the Panorama team appears to have directly colluded with ISIS. My research has been endorsed by former UK ambassador Craig Murray, award-winning former Guardian journalist Jonathan Cook and many others. You can watch a summary of my research here (YouTube has age restricted the video – alternate copy here) and visit my blog for more background. The documentary I am going to make will strike at the heart of the BBC’s global reputation and will potentially reveal its hidden links with the intelligence services. The impact could be earth-shattering. I am privileged to be working on this project with veteran film, television and radio producer Victor Lewis-Smith. Victor has a long association with the BBC and has produced critically acclaimed programmes for the corporation. However after becoming aware of my research Victor tore up his BBC contract and contacted me to suggest making this documentary. We need to raise at least £70,000 to make this project happen. As well as forensic scrutiny of the BBC footage, there will be painstaking investigation, interviews with expert commentators and location filming in the UK and overseas. Your backing will also make sure the project achieves a theatrical release. We can expect resistance from the BBC and other branches of the establishment every step of the way. You won’t just be contributors – you’ll be part of what we hope will become an army of supporters fighting to ensure that this project comes to fruition. It won’t be easy – but we’re determined to follow where the truth leads. Remember – this is a fixed goal campaign, which means that if we don’t reach the full £70,000 by the deadline, backers will be refunded, we won’t receive a penny and the film will not be made. To ensure that your contributions are put to maximum use we’re only offering two simple perks – anyone donating £20 or more can choose to have their name listed in the end credits; if you give £100 you can opt for an invite to the première (maximum 100 invites; venue to be determined). I believe my research leads to only one conclusion: that in the summer of 2013 the BBC – or agencies working through the BBC – colluded with jihadist groups, including ISIS, to fabricate scenes which were cynically designed to manufacture outrage against the Syrian government at a moment when military aggression hung in the balance. This evidence must be made public in order that the world can judge for itself. It’s hard to overestimate the potential impact of this project. The BBC is part of the fabric of our nation. It is the most trusted broadcaster globally. If BBC journalists have deliberately faked an atrocity this would represent the worst betrayal of audience trust in the history of television news. The repercussions would be massive. The BBC and other establishment forces will likely do everything they can to stop this project from seeing the light of day. It may well be that the documentary becomes, at least in part, a chronicle of the obstacles to its making. However, I am determined to make this film. I have spent almost six years researching Saving Syria’s Children. Along the way I’ve been described as “tenacious“, “relentless“, a “bulldog-with-a-bone” and engaged in a “brilliant obsession“. I have bearded the key players in their lairs, sending them scurrying for cover. I’m not about to quit now. No-one could be more motivated to realise this project – all I need is your backing! Share this page far and wide on social media and with your email contacts. Use the Indiegogo share tools at the top of this page (next to the “Back It” button). All my research is on my blog: Fabrication in BBC Panorama Saving Syria’s Children. Media on Trial, 19 October 2017, Bloomsbury Central Baptist Church, London. Organised by Frome Stop War. YouTube has age restricted this video – it can also be viewed on Bitchute. 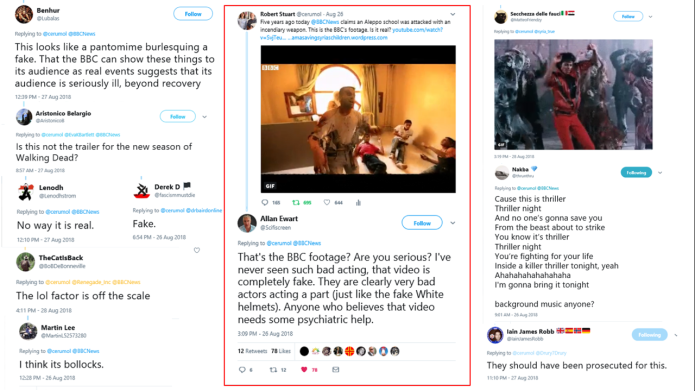 An updated version of this presentation expanding on the links between the BBC Panorama team, ISIS and the White Helmets can be viewed here (also age restricted). Twitter responses to footage from Saving Syria’s Children. Twitter response to footage from Saving Syria’s Children. 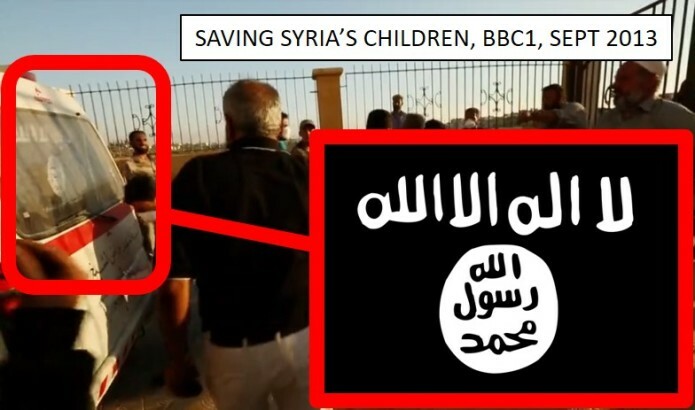 ISIS vehicle and its armed occupants filmed at close quarters by BBC cameraman Darren Conway, Saving Syria’s Children. See BBC Panorama: on location with ISIS.